The B1G Picture sets its sights on Happy Valley. With the specter of Jerry Sandusky hanging over the university, Penn State took the field with much more than wins and losses at stake this past season. We talk with Kevin McGuire of Nittany Lions Den and Tim Hyland, founder of the TCFA Podcast and Intelligentcollegefootball.com about what the 2012 season meant and what should be expected of the Nits going forward. BuckAround: Can Penn State's 2012 season be viewed as anything but a complete and unqualified success? Feelings going into the season were pretty negative, but the team played pretty well and rallied together. Am I missing anything there? Kevin McGuire: I think, overall, the 2012 season has to be seen as a success. Look at the ingredients. Penn State had a head coach making his head coaching debut at a program about to be slammed with NCAA sanctions. The team’s leading rusher and receiver transferred along with a handful of others, including the starting kicker. Penn State started 0-2 but battled back for eight wins capped with an overtime win against the eventual Big Ten champions (with an asterisk if you will, considering Ohio State’s season). The team showed an ability to adapt to a new offensive style as the season progressed and ended on a high note, seeing Matt McGloin develop in to the conference’s leading passer, Allen Robinson busting out as the top receiver and numerous young players becoming dependable on offense and defense. I originally had Penn State pegged for eight wins, maybe nine despite the sanctions and transfers. That said, I could not have imagined things would start the way they did. All in all, I would say 2012 was a successful season without question. TIm Hyland: I don't think "complete and unqualified success" even begins to explain how good (and how important) last season was for Penn State football, and for Penn State as a whole. It's hard to explain just how bad things were at Penn State last summer, just how deep-seated the disdain (and hatred) for the program (and all those who supported it) was, just how much it felt as if everyone in the entire sporting world wanted Penn State football wiped off the map forever. It was a terrible time for the university and a terrible time for everyone associated with it, and in the midst of that firestorm, that football team had go out there and try and focus on the one thing everyone was saying that Penn State should not be focused on at all: Football. You can say that the team shouldn't have played last season, and if you feel that way, I'm not going to argue with you. But I also don't think you could argue with the fact that, in the end, those players and that team ended up doing Penn State a world of good. They started awful, and it seemed that the season was going to go off the rails. Then they rallied and won a bunch of games and, for a while there, it felt good to be a Penn Stater again. They were underdogs, they were scrappy, they played hard and they never gave up. By the end of the season, a lot of people outside of Happy Valley were rooting for that team. If you had told me that would be the case before the season, I simply wouldn't have believed you. BA: The biggest surprise to me was how well Matt McGloin played. Was this simply a player getting better with experience? Was Bill O'Brien that good a coach? Was the old staff just that bad? TH: Matt McGloin was always a better player than people gave him credit for. The kid never had the size or skills of a big-time college star, but he was always a winner, and he was always a fighter. Beyond that, he was very smart; he understood football and he understood the passing game. What got him in trouble early in his career was the fact that he trusted his arm far more than he should. He threw some terrible balls, and created far too many mistakes, simply because he thought his arm was stronger than it really was. That being said, some Penn State fans never wanted him to succeed, because they were star-gazers, and they thought Rob Bolden, he of the four-star ranking, had a God-given right to win (and keep) the quarterback job, no matter what. The bottom line, though, is pretty simple: McGloin was better. From the start, he was better. All he needed was somebody to refine his game. That's what O'Brien did. He took a tough, scrappy, better-than-you-think-he-is quarterback and improved his game in pretty much every way. The results speak for themselves. In other words, yes, O'Brien did a great job with McGloin. But I think people still don't realize that McGloin wasn't exactly awful before O'Brien arrived. He always had potential. He just needed a good coach to help him take the next step. KM: McGloin’s play last season was certainly a surprise, and it showed to me what a difference a quarterback coach and O’Brien’s offensive philosophy brought to the table. Make no mistake about it, McGloin was not the most talented player in the country last season, far from it. But he always had a good amount of self-confidence and his willingness to work for O’Brien and be coached by Charlie Fisher (QB coach) made a great difference between what we saw from McGloin under Joe Paterno and his staff and what we saw last season. He still had some weak moments, but he cut down on mistakes and did not force as many throws as he had prior to last season. Having a couple of years of experience surely comes in to the equation, but I would give a tremendous amount of credit to O’Brien and Fisher, while at the same time complimenting McGloin for taking on a leadership role and really digging in to the offense from the start. BA: A lot of nervous talk surrounded Bill O'Brien this offseason and NFL overtures. How real were these? Does he have a long term future with Penn State? KM: I think there was a real chance O’Brien could be swayed back to the NFL, but at this time some of the talks may have been slightly exaggerated. He did meet with NFL teams, perhaps out of respect for some of the people he knows in the league, but I did not think he would actually leave after just one year at Penn State. He says some things that leave the door open for a potential return to the NFL, and I would advise everyone following the program to come to grips with that. O’Brien is very much a guy that would seem to fit well in the NFL one day, and if he continues to put together a decent product in State College (especially under these conditions) he will certainly remain a hot name in NFL coaching rumor mills for good reason. I would be surprised if O’Brien remains at Penn State for the length of his contract (eight years remaining), to be honest. TH: I can tell you for a fact that at least one NFL team was very, very, very interested in O'Brien. In fact, this particular NFL team may have ultimately settled for their second choice after O'Brien decided to stay at Penn State. Which is to say, yes, O'Brien could have left, and I'm guessing that he'll have more opportunities to leave in the years to come. The guy has impressed a lot of people over the years, and he's considered a potential NFL star. So, yeah, it's hard to say whether he's in it for the long haul. The fact is, he has no prior connections to Penn State and he's facing a nearly impossible situation with the sanctions and the scholarship limits. He's going to be hampered significantly by those penalties and it's very likely that his record will take a hit as a result. Taking that into account, it's easy enough to see why he wouldn't stay; I mean, why would he? Why wouldn't he take a bigger job elsewhere--one that might give him a better opportunity to succeed? Why wouldn't he take the money and run? Well, I'll tell you why: I've heard from somebody who would know that O'Brien really is not driven by money, or at the very least, not solely driven by money. He's extremely focused on the task at hand. Right now, the task at hand is coaching Penn State football. And from what I can tell, it's the only task he's interested in (for now). BA: For someone who doesn't follow Penn State football ever day, what are the key position battles and storylines that they should follow for spring practice and into the fall? 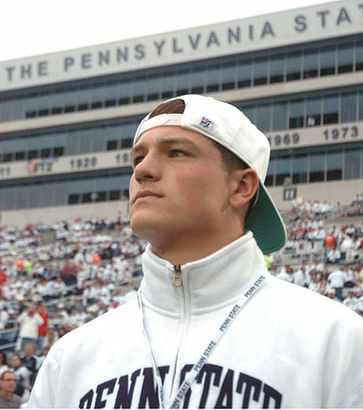 Do heralded recruits Christian Hackenberg and Adam Brenneman have a shot to play? TH: Both kids will have a "chance," yes. But that's pretty much true of anybody on the roster. Such is life when you are trying to run a college football program without your full allotment of scholarships. I think O'Brien is looking at his situation here at Penn State from two angles; first, there is the season at hand, and doing what needs to be done to build a winning team; second, there is the big picture, which includes that point in the distant future when Penn State will actually be eligible to play for something of note again. Hackenberg might be the best quarterback on the roster this year, and Brenneman might be the best tight end (actually, he probably isn't even close to that, but I digress), but whether or not they actually play this year has a lot more to do with O'Brien's long-term strategy than any short-term concerns. As for other position battles, I think it will be interesting to see what happens at running back, where you'll see an interesting mix of proven talent (Zach Zwinak) and exciting youngsters (Akeel Lynch), and at linebacker, where Penn State will be as thin as they've been in recent memory. If I have one major concern about this team, it's there at linebacker. I just don't see where the big defensive plays are going to come from. KM: The most notable position battle this spring may be the one going on at quarterback, but that may actually take on a bigger focus over the summer. Right now sophomore Steven Bench is competing against junior college transfer Tyler Ferguson for the quarterback job, but over the summer Penn State will add prized quarterback recruit Christian Hackenberg to the mix. Hackenberg, by all accounts, should be the next full-time quarterback at Penn State but I would be surprised if Bench does not eventually win the starting job for the beginning of the 2013 season. As for tight end Adam Breneman, he is on campus and practicing with the team. He is being watched closely because he is coming off a torn ACL prior to his senior year of high school football but it seems s though he is progressing nicely. Penn State is pretty stacked at tight end this season, even with a split-tight end offense. They actually moved Garry Gilliam from tight end to offensive line because of the depth, so time will tell how Breneman figures in to the picture in 2013. If he is healthy he will likely find his way in to some sort of rotation at the position, but it may be another year before he becomes more of a featured or full time player. Penn State also will be looking to fill some key spots on defense, after losing Gerald Hodges and Michael Mauti to the NFL at linebacker. They should be able to do that but it will always be an area to watch at Penn State. BA: It seemed like this year's team was able to rally around seniors like Mike Mauti with an "Us vs. the World" mentality. Does that still work in year 2? What are your expectations for 2013? Is this the year that sanctions start to hurt? KM: The senior leadership on Penn State’s roster last season was something special. Those who chose to stay did so with heavy hearts and a tremendous amount of pride. I think to a certain point that pride is still there, but I do not yet know just how much that will come in to play this season. This year’s roster will be a bit younger at key positions normally seen as leadership positions. Penn State loses two linebackers, a quarterback and a vocal fullback who helped speak for the team on so many venues in 2012. O’Brien says new leaders develop on a year-to-year basis though, so it remains to be seen. I think the sanctions may take a little bit more of a toll on the team this year than they did last year. Depth and health are real concerns for Penn State right now. There has to be a point where pride can only carry you so far, but that is something O’Brien will be well aware of. It will be a mighty challenge. TH: That's the biggest question facing this team, I think. Last year, the motivation for the seniors was pretty straightforward: They wanted to save the program. They basically did that, and will therefore never be forgotten. But now we're into Year 2 of this mess, and the more time that passes, the less people--both locally, and nationally--will view this program through the lens of "the scandal." Eventually, it will just become another football team, albeit one that is competing with one arm tied behind its back. Each and every year, these players are going to have to find new ways to motivate themselves, new ways to convince themselves that they are playing for something, when in fact they are going to be barred from playing for almost anything. So you're right: In some ways, last year was the easy year. Now is when times get tough. And I have no idea what to expect. This team could win nine games or it could lose nine games. BA: Speaking of sanctions, do you think the state's lawsuit or public dissatisfaction with the NCAA has any chance of reducing the penalties on the Nits? TH: I honestly don't believe there is any chance at all that the sanctions will be reduced. I don't know of any mechanism that would allow for that to happen, and I honestly don't believe anybody with the NCAA has any interest in making it happen. They made this decision and they're sticking with it. Whether or not you think the sanctions are "fair" is basically irrelevant at this point, because what's done is done, and there are a whole lot of reasons--political reasons, public relations reasons, logistical reasons--why nothing is going to change. I know many in Nittany Nation absolutely hate the idea, but I'm at the point where I really believe it's in the community's best interests to "move on." The players have moved on. O'Brien has moved on. From what I can tell, the students have moved on. I just think it's counterproductive at this point to keep lingering on the past. Embrace this team, embrace the here and now, and enjoy Penn State football for what it is today. KM: Simply put, no. Not a chance. If you look it loosely on legal terms you might find a way that the state can make a viable case, but I am not sold there will be enough to stand on considering the school’s president signed off on accepting any penalties before knowing what they may be. Whether or not signing the consent decree was done under pressure or threats from the NCAA could be a legitimate issue, but I just do not think this will end well for the state. If anything, perhaps some sort of settlement may be the best the state can hope for, which I assume would be considered a win. In that case, perhaps one year could be removed from the postseason ban, and maybe a couple of scholarships returned. But that may be the best they can realistically hope for. BA: Bret Bielema was widely viewed as the B1G's #1 villain. With his departure who takes up that mantle now? Is his departure part of a larger decline-of-the-B1G story or a one-off phenomenon? TH: I have to admit, I was never a big fan of Bielema. The guy seemed to have a very high opinion of himself and also seemed much more interested in Bret Bielema than in the University of Wisconsin. So I'm not really sad that he's gone. As far as who can take his place as lead villain in the Big Ten, I'll just say this much: Tim Beckman at Illinois does seem uniquely unlikable. And as to the significance of Bielema's departure, I think it would be a mistake to read too much into it. The Big Ten certainly has its issues. Losing Bret Bielema isn't one of them. KM: Let me just say this: I’m going to miss Bret Bielema. He really was a lot of fun, even if he did ruffle some feathers. I was shocked to see him leave Wisconsin for Arkansas and I believe it does speak to something about the state of the Big Ten, but from my point of view it speaks more about Wisconsin’s ability to be able to fund a coaching staff. Wisconsin lost how many assistants in recent years? From Bielema’s point of view, that has to be difficult to keep up with when you see what other programs are doing with their staffs in and outside of the Big Ten. At Arkansas, it should be easier to keep a staff in place to provide some stability. The figures show that the money will always be there in the Big Ten, but every school has to use their funds differently for a variety of reasons. As for on-field performance, I think there is still a cycle that can see the Big Ten play on the same level with these other rival conferences, but the trends now lead top talent to the south. For now I think it is pretty easy to say that Urban Meyer at Ohio State is the new public enemy number one around the conference. Really, who else is there that is an annual threat on the sideline and recruiting? And he also has rings. That makes him the one to beat. BA: Do you have any thoughts on Gary Andersen's hire from an outsider's perspective? What's your biggest concern? KM: I really like Gary Andersen and I think he should be a fine coach at Wisconsin. He’s not going to be a flashy guy and he is not going to be a quote machine the way his predecessor was, but he will bring a solid defensive mindset and stick to a running formula to the Badgers, which should suit the program well. I do not think he is the guy who will take the Badgers to the next level after Bielema but I certainly do not anticipate him letting the program fall off from where they are now. After a successful stint at Utah State, where he helped build a winner out of an overshadowed program (Utah, BYU), I want to know if he has what it takes to go up in recruiting against big time programs like Ohio State, Michigan, Nebraska and even Penn State (once sanctions expire). TH: It's an interesting hire, and a potentially good hire, but I think everyone is going to be interested to see how this turns out. I don't doubt for a moment that Andersen worked absolute miracles to do what he did at Utah State. I don't care what you say about the WAC or the general difficulty of the Aggies' schedule, going 11-2 at a place like Utah State is just incredibly impressive. That being said, he's very light on experience at the higher levels of college football, he wouldn't seem to have any kind of network in the Midwest, where he'll need to do some heavy lifting with recruiting, and he's walking into a situation where he's going to have to go head to head with Urban Meyer, one of the greatest coaches in modern college football history. In other words, I wish him good luck, because he's going to need it. BA: What is the perception of Wisconsin football, both the team and the fan base, as a whole in Happy Valley? TH: That's an interesting question with a somewhat complicated answer. Generally speaking, I think many Penn State fans have a very hard time understanding why Wisconsin has, in some ways, been more successful than Penn State has during our Big Ten years. Back when we joined the league, there was a perception, I think, that Wisconsin was somehow a second-tier program--one that Penn State would easily roll over. Well, that hasn't happened. Especially in more recent years, Wisconsin has been the more successful, more consistent program, and yet this idea that Penn State should be better somehow endures. I'm not saying that's right, but I am saying that this particular mentality is out there. And I guess that's why most Penn State fans wouldn't really consider Wisconsin one of their big rivals. Anyway, beyond that, I would say most Penn State fans view Wisconsin fans as a good bunch; there are, of course, your typical stories of Penn State fans having a rough go of it during a visit to Camp Randall, but you'll hear just as many positive ones. Broadly speaking, I think Penn State fans see Wisconsin as a program and as a fan base as a real asset to the league. Your passion for the Badgers is undeniable. You've got a great stadium. You've got a great fight song. You've got some great traditions. And you're not Ohio State. KM: The recent rivalry, if we may call it that, with Wisconsin has been a fun one to watch. From Bielema taking advantage of the kickoff rules to run time off the clock by intentionally having the special teams unit run offside, to Daryll Clark fist pumping in the Badgers end zone and to the more recent games that determined a Big Ten Leaders Division championship and another that was decided in overtime, this series has given us a lot of reasons to look forward to the next match-up. At the same time it does not seem to have the animosity other teams seem to bring out from Penn State fans, with that being reserved for the likes of Ohio State and Michigan. To me, the Penn State-Wisconsin series appears to be one of mutual respect. Sure, there may be some insults thrown at each other during the week of a game, but overall I cannot say there is too much bitterness between the two. BA: Thanks for your time, guys! Great Stuff! Kevin McGuire is the host of the No 2-Minute Warning podcast and managing editor of Nittany Lions Den which can also be found on Twitter here. and is the college football writer for About.com. He can also be found on Twitter. Posted in The B1G Picture and tagged with Bill O'Brien, Penn State, Adam Brenneman, Christian Hackenberg. April 27, 2013 by Buckaround.